The Classic Cuisine 5PC Stainless Steel knife set is perfect for the professional chef, culinary student and the home cook. The set includes a heavy duty zip up case ideal for travel and storage. Our ergonomically friendly knife handles have a rubber, non-slip comfort grip cover. This set makes a great gift for any cook or professional chef. IMPORTANT: Avoid buying counterfeit products and transacting with unauthorized sellers. Look for our logo on the packaging for every one of our products. Classic Cuisine is committed to providing the consumer with the absolute best price and value on our entire line of products, which we ensure by applying a rigorous Quality Control process. 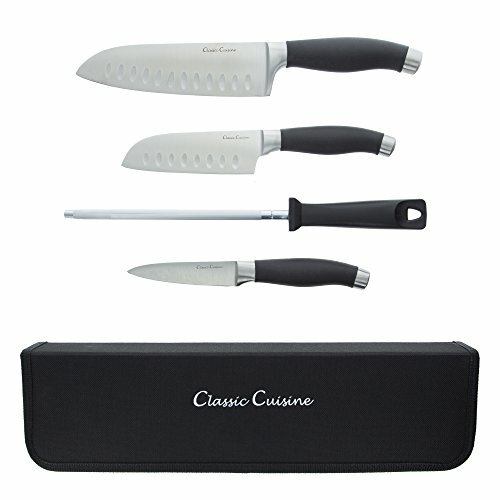 PROFESSIONAL CHEF QUALITY - Classic Cuisine's 5 pc knife set is intended for long lasting use and is constructed using high quality material. The hand forged stainless steel knives with ergonomic non-slip comfort grip handles are designed for hours of use without hand stiffness or discomfort. EASY TO STORE AND TRAVEL - The heavy-duty zip close nylon bag is great for storing your knives between cooking uses. The storage bag is also a convenient and safe way to transport your knives to work at the restaurant, culinary school, vacation or anywhere you know you will need quality cutlery. GREAT GIFT - Any professional chef, culinary student or home cook will love this knife set. A great gift idea for weddings, house warmings, graduation, to add to a registry list or any occasion.